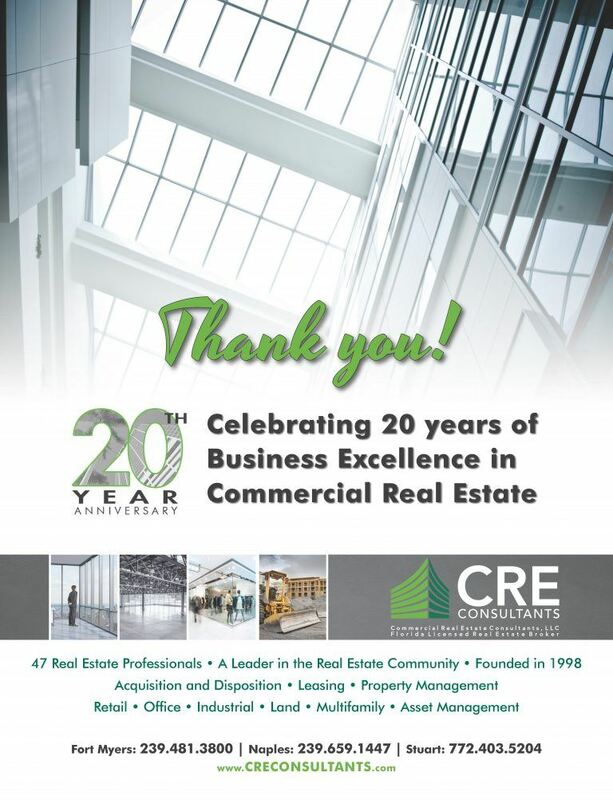 Naples/Fort Myers/Stuart, FL — CRE Consultants (formerly CBRE Fort Myers/Naples) is proud to announce its 20th year in business in Southwest Florida’s commercial real estate market. This 20th anniversary marks an important milestone for the privately-held company still led by two of the original founding partners; stan stouder, CCIM and Randal Mercer. Their mission from the start was to build a company that provided top commercial real estate professionals the best platform to deliver unequaled strategic, client-centric and meaningful solutions while building long-term relationships. This philosophy has been the foundation of the company’s success. CRE Consultants has successfully navigated the ever-changing commercial real estate landscape executing more than 10,000 transactions since it began in 1998.